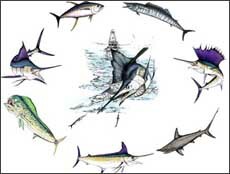 The Florida Keys are host to a multitude of Billfish tournaments throughout the year. 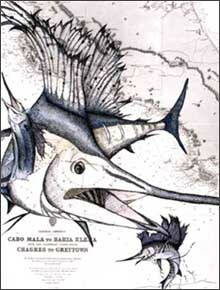 These images have served as awards and trophies for tournaments from Key Largo to Key West. 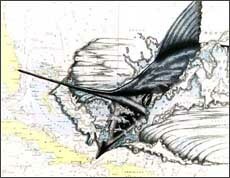 Nautical Charts of Costa Rica, Venezuela, the Bahamas and Cuba are layered with the likenesses of Big Blue Marlin, White Marlin and Sailfish. All the action is waiting for you. 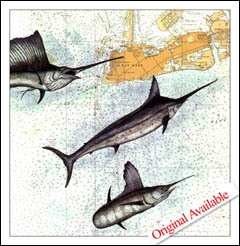 With the boat fading in the distance these "Hoos for Sail" Sailfish hungrily strike the baits as they are trolling by. As a big blue bill breaks through the waves, the name "The Rush" says it all. 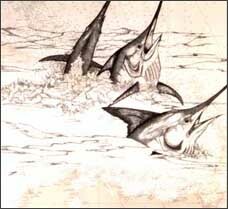 Costa Rican waters are synonymous with Sailfish, "Three Bills" shows you three views. "Marr-lin" is owned by Mr. Marr. He fishes Venezuela's generous waters. 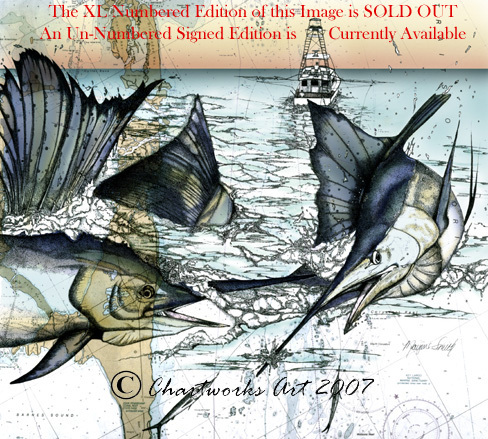 "Offshore Seven" Not just Billfish...this one includes a few of their friends.